We have a lot of customers who reach out to us asking about the rules for riding jet skis in the Hamptons. 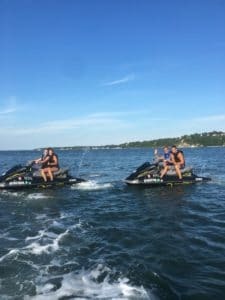 Jet skiing in the Hamptons can be a great way to have fun out on the water, but its important to know the rules and laws before you go. The Hamptons are in New York State, so all boaters are required to follow New York State Boaters Safety laws. The New York State Parks Department posts all of these rules online. The two most important things to remember are New York state boating safety certificates and safety equipment. All boats in New York must be registered before they are operated on public waterways. They must also carry certain pieces of safety equipment. For jet skis, that equipment includes, but should not be limited to, a fire extinguisher, a noise producing device and a safety lanyard that ensures that the ski turns off if the driver falls overboard. Jet skis must be operated away from other watercraft and away from shore when operating at speed. Jet skis do not have lights and are prohibited from being operated after sunset. 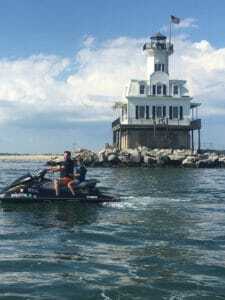 A New York State Boaters safety certificate is required for all Jet Ski operators in New York. This certificate can be obtained by taking an online course or by attending a course. This certificate is required for all operators regardless of age. The minimum age to operate a jet ski is 14 years old. If you would like to ride a Jet Ski, but don’t want to go get a boaters safety certificate, there is another way! When you rent Jet Skis from Peconic Water Sports in the Hamptons or on the North Fork of Long Island, you do not need a boaters safety certificate. This is because you are being supervised by one of our trained Jet Ski Guides. We provide a simple 20 minute safety course and provide hands on instruction of how to use our equipment. Our jet skis are all brand new and professionally maintained.